We bought this desk about 4 months ago. 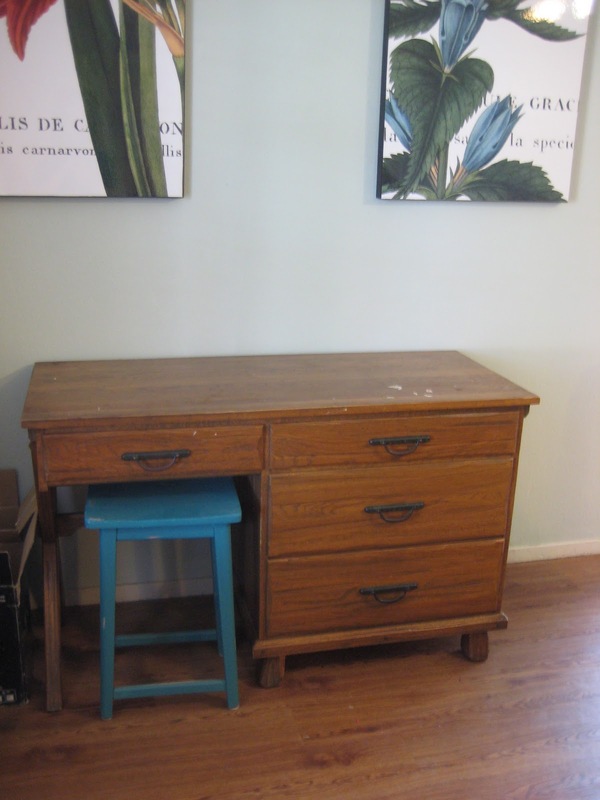 I was looking for a desk for the living room, and I saw this baby on Craigslist. Since the price was hard to beat and the seller was willing to deliver, I went for it. And then I tried to use it. And it's a little squishy--especially if you like to cross your legs under the table. So, I decided to sell it and go with something less constraining. Unfortunately, after about a month or so for sale, there has only been one bite. Now, I have a dilemma. Do I paint it? Do I give it away? If I do paint it, what color should I choose? I think part of the reason I haven't touched it is because I'm not sure whether to go bold or neutral. 1. Next week I'll share with you guys about something that I've been cooking up. 4. I've been gathering little goodies for a December giveaway and will be making the final touches to the bundle soon! 5. I've been procrastinating on many projects that I've been wanting to do and my poor blog is evidence of that. I think I've been so busy stocking the shop that I haven't had much time (or inspiration) for anything else! 6. IF YOU HAVE A SHOP WITH HOMEMADE GOODIES...I'd love to do a couple posts highlighting handmade shops. Want to do a giveaway? I may be up for that too :) Zip me an e-mail (you can find it under the Contact Me tab) if you are interested! 7. I'm excited for Thanksgiving on Thursday! 8. Last year, I was a little more on top of things and made a turkey onesie for my dear friend's baby girl, talked about how thankful I am for my family, and wrote a post about how much I love Macintosh.